I Designed An Adirondack Chair For Kathy Peterson! Here is my chair! I hope you like it as much as me and Asher do! A magnolia and that scary bird! A few weeks ago, I got a very interesting email, inviting me to participate with 4 other stellar designers to design a chair for Kathy Peterson and the Cedar Store. I was excited about the prospect and when my chair arrived, all ready to paint, I was even MORE excited! This chair is made of cypress and when my husband put it together, he was amazed at how well it was made. And it did not even need any sanding! I thought about my design for several days ( I had so many good ideas!) and then a friend said, "you should paint what you love" That is always good advice. So of course it was going to be birds and flowers. 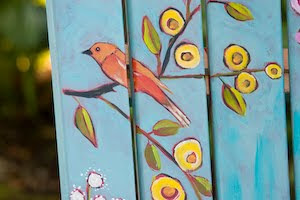 I laid down an underpainting of red paint, on a sunny day when everyone else was building us a new deck... and then I sketched in my birds and flowers. I painted over the red with my favorite blue and left bits of it showing. On the arms, I painted two of my favorite birds... they look kind of mad, which I find funny, like my chair is saying don't sit here! Which means I will get to sit there, because I painted the birds and they don't fool me. I also added a couple of spiders, to make sure my chair is available when I want to sit in it. By the way, the birds are from an amazing Taiwanese photographer, Sushyue Liao, I paint using his photos as reference by permission, but if you don't want to find your own amazing photographer, you could find some bird and flower images to decoupage on to your chair. You could start by using the red underpainting, then glue on your images, then paint around them with your favorite color, leaving a bit of the red showing through. Please stay tuned for the other designers chairs every tuesday for the next three weeks. And CLICK HERE to Kathy's blog for sneak peeks and info! 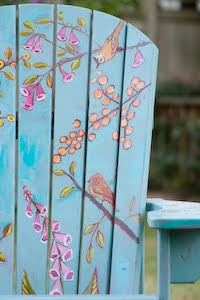 And here is the Cedar Store website where you can buy your own wonderful cypress chair to paint! Thank you, Kathy, for giving me this amazing opportunity. I loved every minute of it! 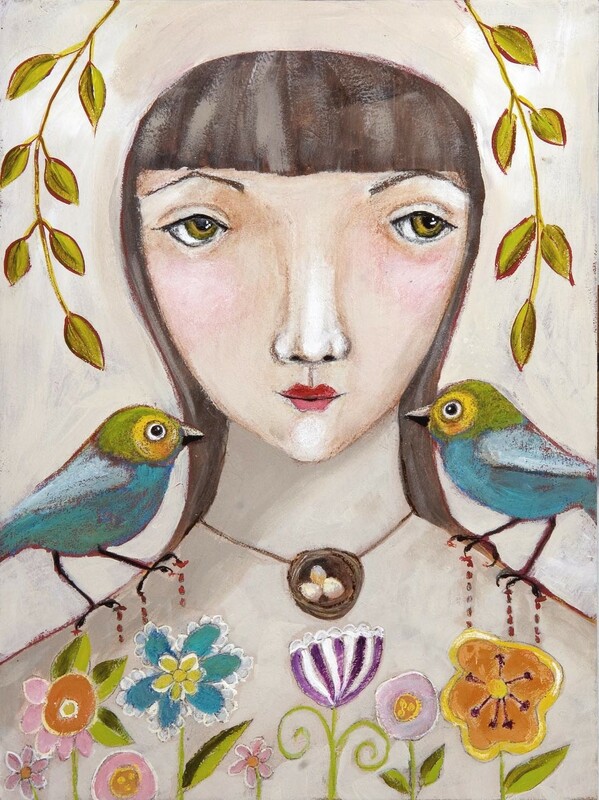 New print Week 13 print project "Looking for a Nest"
I have not been able to paint this week. 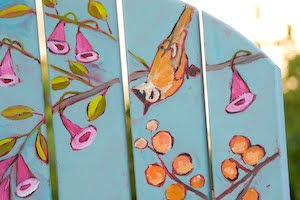 But I just realized I could use this bird from the chair I painted for Kathy Peterson's Design My Adirondack for my print. This bird looks how I feel. I have been working on getting the house ready for sale and my studio is so clean it hurts. I am being ruthless about getting rid of stuff. And hopefully soon, I will be finding a new nest. Next tuesday I will be showing the chair I designed for Kathy Peterson. It was really hot. We camped at Wanapum State Park. It was windy. It was crazy windy. I did not go to the concert, but I had more fun this weekend than I've had in a year. It was fun because of these kids. They lift me up. They heal my heart. Here's a picture of most of them with Dave and the dogs down at the lake. Bryce, April, Chelsey, Coco, Dave, Zoe and Flight, Jakah, Niki, Amie, missing is Chris T, but not forgotten. He was out buying me some gin. I was so moved by the "Fix You" Travis Wall piece on SYTYCD. It's one of my all time favorite songs, Allison one of my all time favorite dancers, and it's about trying to fix your mother. It killed me. I can't find the 3rd one that shows the judges comments. I have been painting myself silly on the project for Kathy Peterson, it is due on monday and since we are going to The Gorge, I needed to get it done today, and I did. Whew! I also painted this little bear today. He has issues. Don't ask me to tell you what his thoughts are, you don't want to know. Really. I am working on a secret project with Kathy Peterson. She is also having a giveaway here. You should go check it out. I have to get it done this week, as we are going to Columbia Gorge to see Kings Of Leon. Or maybe not, I might chicken out about going to the concert, but we are going camping for sure, so I will be working on my project this week to get it done before the deadline. I'm quite excited about it. I also will be posting the print on Tuesdays from now on. I'm pretty sure this week's print will be a bear. I have not mailed giveaway prints yet, for last week, but I will do that tomorrow also. Here is a random bird painting that I ended up painting over, but I loved that bird, the big one on the left. I don't think I've posted it yet, but if I have, forgive me. I hate doing a post without a picture. I did add a new picture just now. Much better and cropped right. The winners are comments number 15,11,27 13. I used the random number generator to be fair. I'm too tired to figure out who that is, but if you want, you can count the posts and figure out if you are a winner. I appreciate all the love, you sweeties! 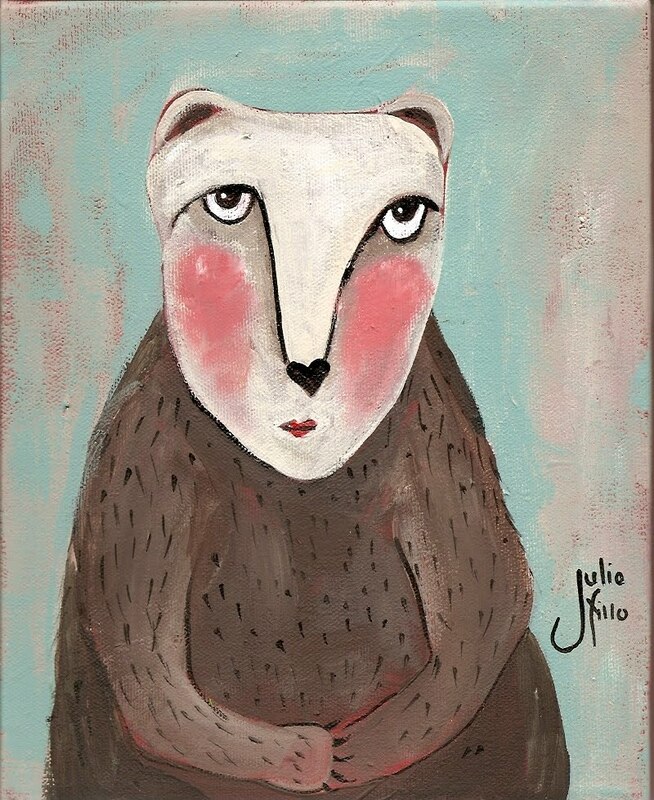 If you are one of the winners, please email me at Juliefillo @hotmail.com and give me your mailing address, and your 8x10- will be on it's way. I am going to be late with the print, it will probably be tomorrow, this deck build has kept me hopping! The new print will be titled, "Their mother waits for the garden" It's sort of a self portrait. I have made so much food this weekend and I have been cleaning cupboards and closets getting ready to list our house for sale... I have not had much time for painting, but it's almost done. Today, our son, Ryan and Niki and Jamie and their dog, Wrigley came and worked on the deck. Here are some pics. Seriously, if these kids had not come in and worked so hard on screwing in screws, Dave would have been doing it until November. And Ryan, he works so hard. Thank you, darling son. Ryan, such a sweet, good son. Wrigley. He dances like a Lippizanner Stallion. Wonderful friends and our son and daughter in law and son in law came and helped Dave rebuild our deck. I made food and watched and took some pictures. This deck has needed to be replaced ever since we bought the house, 7 years ago. Our son knew someone who was tearing a new deck off a house and got us the wood. It's not done, we still need to make the railing and we are planning to put a grape arbor in along the long side, but we can walk on it and the dogs can go out the back door again to go potty. It's been torn off since Wednesday. We are so grateful for the help, we could have never done it without them. Ed Dent, his parents, Michelle and David and our DIL, Kim, eating dinner during a break in the work. Trixy, Aishi and Bryce's arm and legs. My husband Dave, in the overalls screwing in a temporary support for grape arbor. Our son, Ryan, our SIL, Bryce, and David Dent.